This guide will show you how to Reset Pages, Reset Blogs and Reset Site. When you are on SiteBuilder Editor you will see Reset Button. Click on the Reset Button. Then you will find three option. Choose an appropriate option. 1) Reset all Pages – This will Reset only Pages. 2) Reset all Blog Posts – This will Reset only Blog Pages. 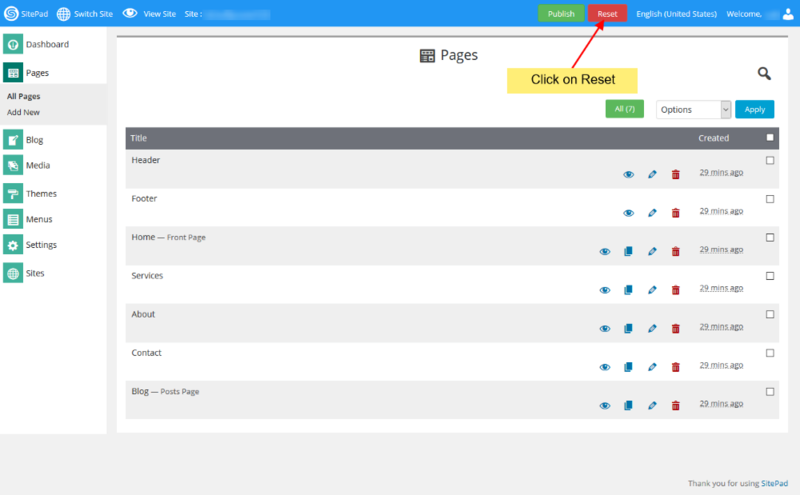 3) Reset full site – This will Reset full site (after reset you will need to start making the website from scratch). Once you select the option then click on Continue Button. Then you will see a confirmation box. When you click on Yes, Reset Button it will process ahead with the option that you have just confirmed. Once Reset is done it will reload the page. Note: On Full Reset you will be redirected to Themes where you will need to select the new theme.